The Easter weekend is traditionally a time when keen gardeners roll up their sleeves and get set to make their garden look glorious. If you’ve got a cat roaming around, however, you’ll need to be mindful of what you’re planting. While cats are discerning eaters and usually instinctively avoid eating poisonous plants, it’s best to stay vigilant. Lilies are one of the most dangerous plants for felines. Most commonly ingested from cats getting pollen on their fur and then licking it off, they are particularly toxic – from the stamen and pollen to the flower itself. Other outdoor plants to watch out for include sweet peas, snowdrops and poppies. 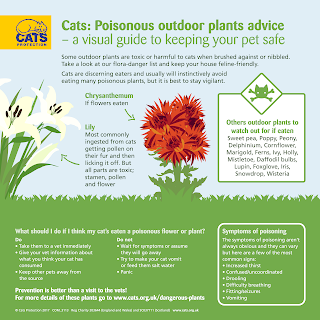 Take a look at our visual guide on poisonous plants for tips on how to keep your cat safe. How will I know if my cat has eaten something poisonous? What should I do if I think my cat has eaten something poisonous? If you’re worried that your cat has ingested something, take them to a vet immediately. Give your vet information about what you think your cat has consumed and make sure you keep all other pets away from the source. Don’t wait for symptoms or assume they will go away. Don’t try to make your cat vomit or feed them salt water.